In this lesson, we will learn how to divide decimals by other decimals up to thousandths to evaluate algebraic expressions. A roll of cloth, with a length of 280.54 metres, is divided into pieces of equal length. 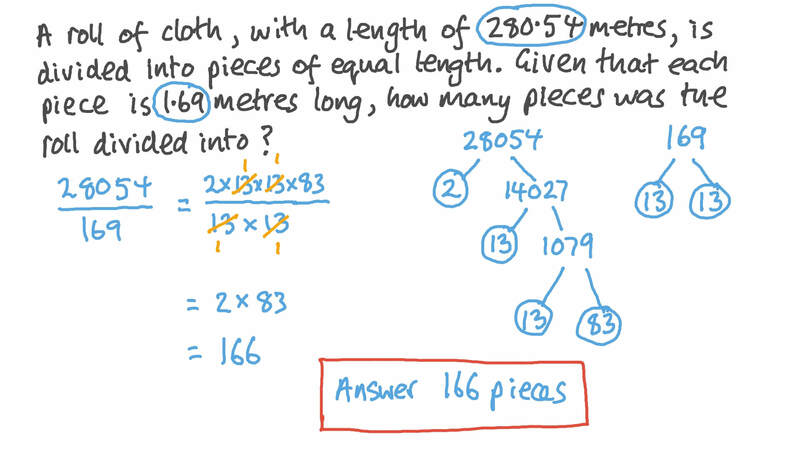 Given that each piece is 1.69 metres long, how many pieces was the roll divided into? Calculate 0 . 7 7 2 ÷ 0 . 4 . 3 3 3 . 9 ÷ 0 . 6 3 = . 4 0 6 . 2 6 ÷ 0 . 6 1 = . Calculate 3 7 3 . 9 ÷ 6 6 . 6 , rounding your answer to the nearest tenth. If 𝑚 = 8 9 . 3 and 𝑝 = 1 7 . 8 , evaluate 𝑚 𝑝 to the nearest tenth. A factory makes coils of copper wire which are 10.5 cm long. How many coils of wire can the factory make from 3,252.9 m of wire? 1 . 3 6 ÷ 1 . 7 = . 3 3 . 3 6 6 ÷ 6 . 7 = . On her way back from her trip, Amira bought some postcards for her friends. Her total bill was $5.60. If postcards are $0.40 each, how many of them did she buy? If the average growth rate of an animal is 1.5 inches a day, determine, to the nearest tenth, the number of days it would take that animal to reach 40.058 inches. If 𝑚 = 5 1 . 3 , 𝑝 = 2 2 . 3 , and 𝑛 = 2 , evaluate 𝑚 𝑛 𝑝 to the nearest tenth. A group of people split 146.20 LE between themselves. Given that each person got 8.60 LE, how many people were there in the group? The orbit of a satellite is 26 889.84 miles long. Given that the satellite travels at 212.4 miles per minute, how long does it take the shuttle to complete the orbit? A light-year, the distance that light travels in one year, is 5.88 trillion miles. How many trillion miles does light travel in one month? Calculate 5 1 . 1 5 6 ÷ 9 . 8 . A plant 4.5 feet tall is in front of a building that is 44.37 feet tall. How many times smaller is the plant than the building? Calculate 0 . 3 2 4 ÷ 1 . 6 2 . Which of the following values of 𝑎 and 𝑏 make the following statement true: 𝑎 and 𝑏 are two positive decimals such that 𝑎 < 1 , 𝑏 < 1 , and 𝑎 ÷ 𝑏 < 1 ? A number is multiplied by 0.11, and the result is 52.91. What is that number? Calculate ( 3 4 . 8 ÷ 8 . 7 ) × 2 . 5 . Fill in the blanks: 6 2 . 2 4 ÷ 3 . 2 = ⋯ × 1 0 3 . 2 × ⋯ = ⋯ . Given that 6 1 4 1 ÷ 6 9 = 8 9 , find the value of 6 . 1 4 1 ÷ 0 . 0 8 9 . The numbers in the first row of the table below are multiplied by the multiplier to get the numbers in the bottom row. Complete the missing numbers from left to right.